A small business website talks directly to your current and prospective customers. You do this every time you talk on the phone, email and meet someone in person. All a website does is automate this process. For example, you meet five people today. You give them your business card and a brief description of your company. Three of them ask you some questions about your services. While you are telling them about your services, you say that you have great examples and free training (tips, eBook or something) on your website. You also tell them that you have weekly updates to keep people up to date with your services, products and the industry. Most importantly, everything your talking about is on you’re website if they have any questions. They can now see for themselves all you do from your FREE articles on your website. The more you talk and help your customers online the bigger your business will grow. A website is your Small Business Internet Voice. This is a basic business rule with an Internet twist. Be nice and give your customers 110% and they will love you! That is why it is important to plan your website. You want to have an Internet Voice that is consistent and that that people remember! Most Importantly – tell the world your story in your own words! The simple website plan has two things: content and context. First you need to have content on your website. The form of the content isn’t important (text, video, audio, pdf, etc). What’s important is that it’s relevant and it’s the correct context for your audience. If you are a technical person like me but your clients aren’t , then everything you write cannot be that technical. Trust me, it’s hard at times. (Thank god for my wife!) Just because you understand something, doesn’t mean your clients will. You have to put it into words that they will make them understand. You want people finding you online, not you finding them. Most small businesses are going out of their way searching for customers – cold calling, paying for advertising, soliciting etc. These methods might work for your business. However, if you wrote small helpful informational articles each week and you submit them to different places, you will get the word out and help people and therefore get a following. Over time you build up hundreds of these articles, which are found on Google. This is how people find you in today’s Internet driven society. The plan is to give FREE tips and information. Short and to the point articles that you will write or record on a weekly, bi-monthly or monthly time frame. Your Internet Voice is every communication you make online that promotes your business. This is how you interact online. Remember everything online is searchable and is stored. Meaning all these communications over time build up and promote your business. This means tell stories! Talk about your experiences with customers and solutions you have given. Plan your website in your own voice! Write and talk in your natural voice. Keep it simple! Small useful articles without fluff! Remember that your Internet voice is the way the world sees you. A lot of that is the Google Search. Make sure you can be found and are posting the right content for your business. 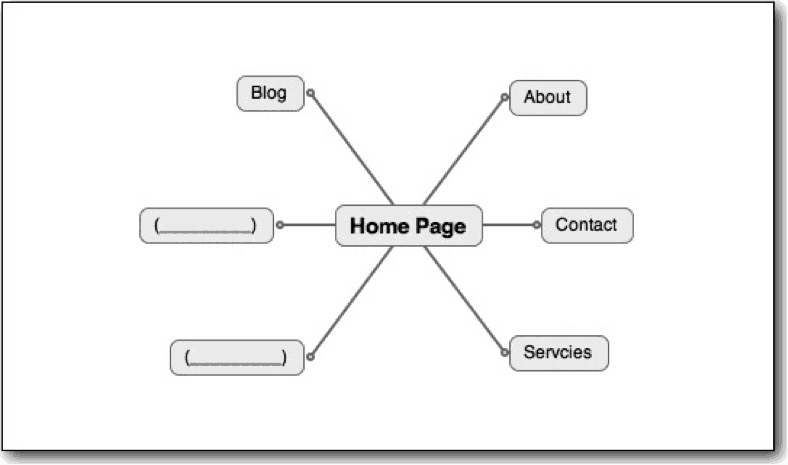 The basic small business website layout as above consists of a Home, About, Contact, Services/Products and Blog pages. This is a simple layout for most businesses. With WordPress, you can add and edit pages instantly. You may need other pages either under the above or where I left the blank pages. Tip # 4 Four Strategic Questions to Ask Yourself Before Building your Business Website? How will I make money from my website? If you are making a small business website, you have to decide how this website will expand your bottom line. Get leads for offline business. Sell other people’s services or products. What are my competitors doing online? List five of them with their websites? Google your competitor. Use maps.google.com to look at local businesses. Google your industry names and keywords to find who are your top competitors. Find out what your competitors are doing online. Look at their websites and social media sites. What information do my customers need? What are they dying for? Do Google searches with ‘new’ ‘exciting’ ‘cutting edge’ and your industry, services or products you sell. Solve a problem your customers have. What are my goals of a business website for the next year? Do you want to attract new clients, make money from services or products or build brand awareness? Do you want to use new technology to lower your overhead? Answer the above questions. Write them out. Read the answers to yourself. If you have a business plan, these answers should be in them. You will need these answers for the next step. Technology clutters the brain. The planning phase is about what your message is and how you are going to broadcast it. Get started with writing or recording your message. Keep your goals focused and go in little steps. Remember, if you don’t feel you’re a good writer you can always record yourself for a podcast or for transcribing. Remember that a website is marketing. Marketing is promoting your business. If you create a website that you are constantly updating information for and will be promoting a while this will make your website the go-to place for your Industry. This takes time and dedication. Great Job!! Make sure you have your four questions written out before we get to Keywords and Website Goals. This is how people will find you online. You probably already do this when you talk to your customers. Now you need to write them out. Comment below and let’s talk about planning your website. When you’re ready, read the next section on Keyword secrets.